World-famous Giants Causeway is located in County Antrim, along Northern Ireland's lovely coastline. This natural attraction is a collection of hexagonal basalt columns and rock formations that lead out into the water off the coast. The spot is rooted in Irish legend and history, making it both a scenic destination and a cultural hotspot. It is also easily one of my top 10 recommended sights to see on the Emerald Isle. The Causeway is easily accessible from major tourism destinations in Northern Ireland. It's just an hour's drive from Derry along the A2, and it's just a few minutes longer if you head from Belfast along the M2. There are also frequent trains and buses departing from both cities, plus miles of walking and cycling paths from nearby villages. Here some fun facts about the Giants Causeway. Hopefully they will entice you to pay a visit in person! But if that is not possible, you can always use them to impress your friends with your knowledge of one of the most-visited landmarks in Ireland. Legend holds that the Causeway originally stretched all the way to Scotland. Benandonner, a Scottish giant, was tricked by the wife of Finn MacCool, an Irish giant, and ended up breaking apart the Causeway, leaving the partial pathway we see today. Across the sea in Scotland, there is a similar collection of basalt columns. It's easy to see how a legend formed that connected these two natural landmarks and tied them into the same story. Less imaginative scientists have concluded that the Giants Causeway was formed thanks to volcanic activity more than 50 million years ago. The columns were created as the lava cooled rapidly in the ocean water. Today, the Causeway is one of the most notable landmarks in Ireland. It was recently voted the fourth natural wonder of the United Kingdom, and it is a UNESCO World Heritage Site. 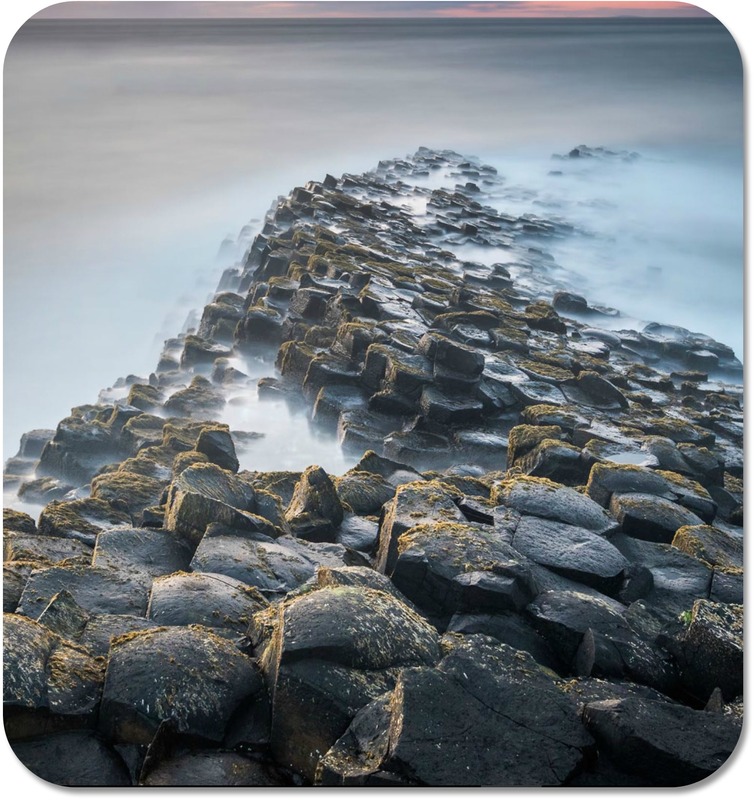 The basalt columns of the Causeway are considered hexagonal, but a closer look reveals that many of them have six sides... and some have five, seven or eight sides. That variety makes the formation even more attractive and interesting to the eye. 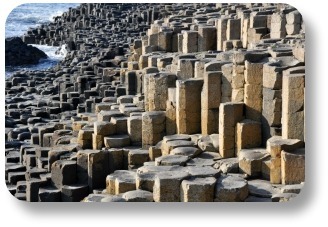 There are over 40,000 interlocking basalt columns that combine to make up the Giants Causeway. They vary in height, but keep your eyes open for the columns that are over 35 feet in height. The Giant's Causeway can be broken up into six distinct sections, and many visitors want to see them in order. The six sections are the Camel, the Granny, the Wishing Chair, the Chimney Tops, the Giant's Boot and the Organ. Have you ever heard the phrase, "If at first you don't succeed, try, try again"? Legend holds that it was first uttered in a cave just outside the Causeway as Robert the Bruce watched a spider try to weave a web in the wind and rain in the early 14th century. The area in front of the Causeway has been the site of countless shipwrecks. In the 16th century, more than a 1,000 sailors died when a Spanish ship sank, so some now call the landmark Spanish Rock in remembrance. On your way in or out of the site, check out the Giant's Causeway and Bushmills Railway. This heritage railway is just two miles long, but it connects the iconic landmark to the town of Bushmills, which just so happens to boast the Old Bushmills Whiskey Distillery. For more information, you can visit the official website for the Cliffs here.